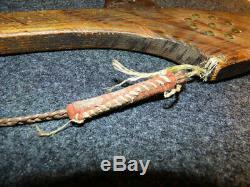 Original Sioux plains Indian gunstock war club. Very beautiful ash "gunstock" adorned with old tacks. Nice forged iron blade pinned in place with one pin. "Gunstock" is solid and strong. Reservation made for the tourist trade c1940. Beautiful piece, a work of art. 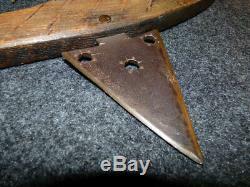 The surface of the wood and spike show a nice patina. Originates from a Cincinnati Ohio estate. Please ask any and all questions before you make an offer. 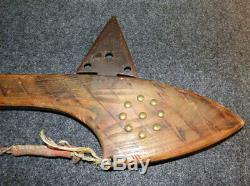 The item "1940's Reservation Northern Plains Sioux Indian Gunstock War Club Forged Blade" is in sale since Saturday, February 23, 2019. This item is in the category "Antiques\Ethnographic\Native American". The seller is "fortancient" and is located in Cincinnati, Ohio. This item can be shipped worldwide.